Getting there: From Austin head west on Highway 290. After near 30 miles turn north on RM 3232. Continue north until 3232 dead ends into a T-section in the road. 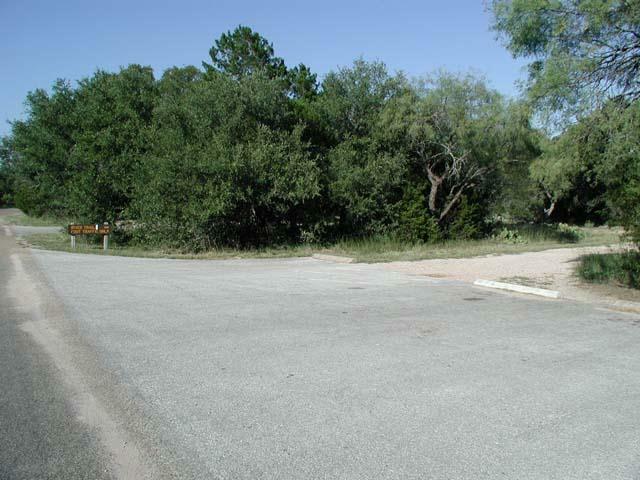 The entrance to Pedernales Falls State Park is to the right off of FM 2766. Upon entering the park continue, drive approximately 3 miles and take the second right turn after the park headquarters building. Take the second left turn in the camper parking area and continue to the T-section at the back of the camper area where there are a few parking spaces for hikers. The Hike: If Pedernales Falls State Park has a wild side, the 4 Mile Loop trail is it. While not particularly rugged or remote by backcountry standards, the trail's position on the opposite, unbridged river bank from the rest of the park serves as a filter for the vast majority of park visitors. Considering how easy it is to get across the river this says much more about the people who visit the park rather than the trail itself. 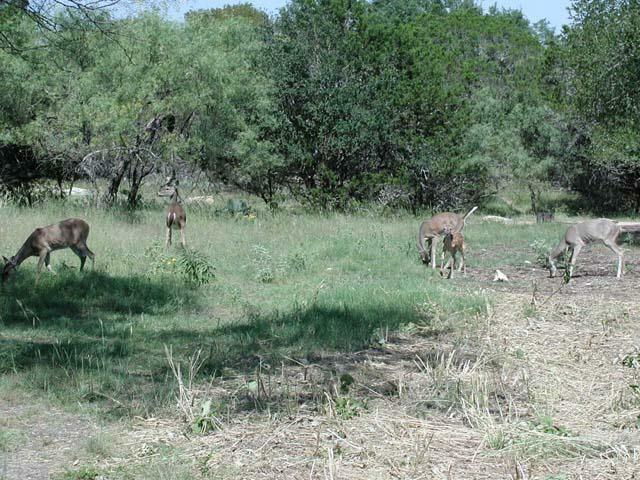 These deer were initially startled by our presense, but quickly returned to their foraging. The day's hike begins at the waypoint "Trailhead". Our first surprise of the day occurred literally within feet of the beginning of the hike. As we passed by a Cedar tree we startled, and were startled by the presence of, five deer feeding on a patch of grass that had been mowed recently by the park. 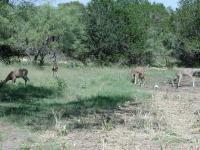 Once the initial shock subsided the deer went back to their grazing about 50 feet from us. We stood there silently for a couple of minutes until the child of a camper noticed the deer, but not us, and promptly charged after them on his bicycle while bellowing the less than endearing chant, "kill the deer!" The river crossing could not come soon enough for us. 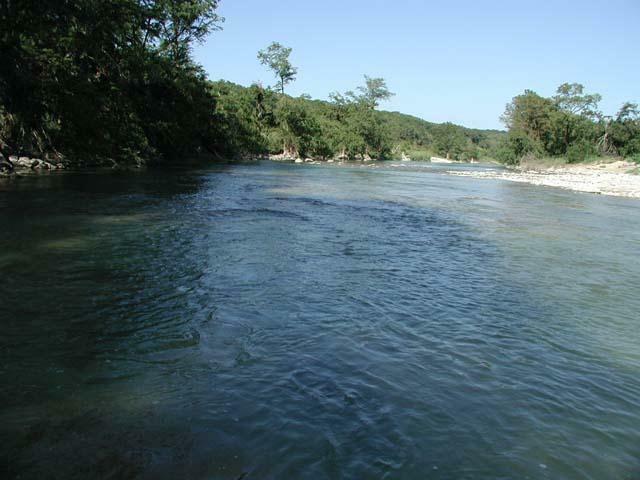 The Pedernales River, looking upstream from the trail crossing point. Rivers are often differentiated from creeks by whether there are tributaries that run into them. By this definition the Pedernales River is indeed a river. By the standards of how much water flows between its banks the Pedernales on our the day of our trip might better be termed a large creek. Don't be fooled for a minute that this unassuming body of water can not pack a punch when conditions are right. The condition of the river banks provide ample proof of that. 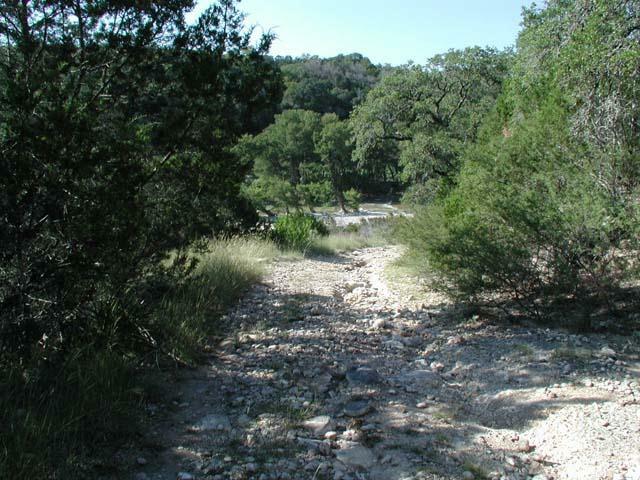 A view from the trail, looking back down to the Pedernales River. I had hiked the 4 Mile Loop several years ago. On this trip, when I got toward the banks nothing looked familiar. Nothing at all. When we approached the actual river crossing I recognized the place immediately and saw the signs of momentous change. Areas that had been heavily covered were now sandy and grassy. Huge trees that towered over the area were knocked over or gone. 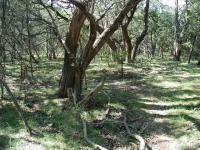 Those trees that remained bore markers to show just how big the little Pedernales could be. Above our heads log and brush debris marking the highpoint of a flood that must have crested 20 feet or more above the current water line and well above our heads. The Pedernales is typically small, but she can pack a punch after heavy rains. The river crossing requires wading in the cool and moderately rapid waters as they rush over a smooth rock surface. Rather than a chore to be dreaded, the crossing is a refreshing treat and will be again on the return journey. 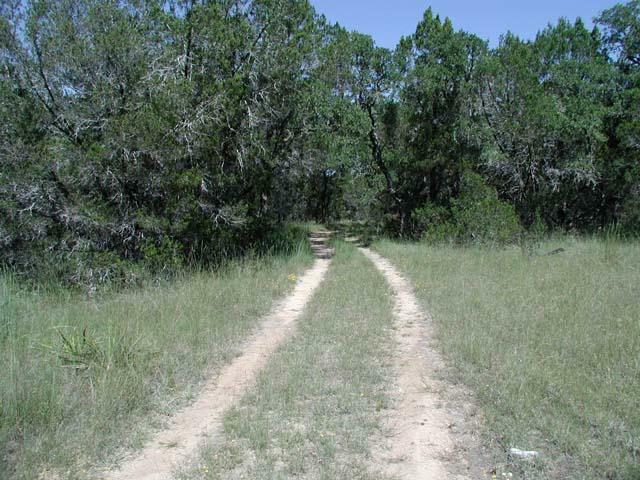 Much of the 4-Mile Loop follows old ranching jeep trails. Once on the far side of the river, the hiking begins in earnest. The trail leaves the rocky river bed and climbs immediately upwards. After about 50 feet of ascent the trail levels off somewhat and continues east. The main 4-Mile Loop trail does not contain many scneic vistas, but a short side trail along the way has some like this one. 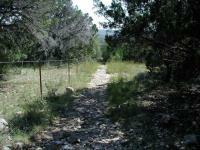 One of the reasons why the 4 Mile Loop may not be as popular a hike is the trail condition. It's usually easy to follow, but is typically not marked, save for a few trees with painted while blazes. After a summer growing season a good portion of the trail was overgrown with grasses that swiped at legs and feet. This situation is ideal for catching chiggers, so bug spray is recommended when such conditions exist. The trail forks at the first "Y-L" waypoint on the topo map. We chose to hike the loop in a clockwise manner. At the waypoint "Y-R" there is a small open prairie with what appear to be numerous trail options. The main trail continues to the immediate right. A short side trail continues straight here and is shown on the topo map in blue. This detour provide several towering views of the western side of the park below before it runs into barbed wire fence. The back corner of the loop contains the steepest portions of the hike. The park boundary is the fencing on the left. A word needs to be said about the track on the topo map. Due to precision errors in receiving the GPS satellite signals it looks like we crossed over the dashed line that marks the northern park boundary here. We never crossed the fence line here nor anywhere else in the park and of course no one else should either. The trail surface varies from grassy and flat to rocky and steep conditions. The trail was strangely soggy for some distance along the park's top boundary. We were more than happy when we turned at the far corner and headed south down the steep, but rocky and dry, slope headed south. The cemetery found at the back edge of the park serves as a reminder of the people who lived and worked this land before the park was established. This particular cemetery is also quite mysterious for it offers no clues concerning who is buried here or how long they have been at rest. There are no headstones that are legible. The iron fences that surround some of the plots are the only obvious indication that people are buried here. The trail on the second half of the hike tends to be somewhat easier to follow since it's based on an old jeep trail that has been heavily used in the past. 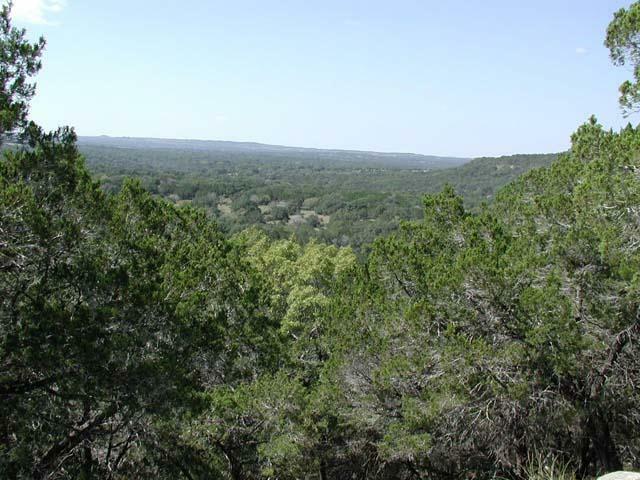 At this point the hike is also slightly less hilly, with most of the elevation change going down, back to the Pedernales River. We recorded a hike of about 5 miles, one mile longer than that reported by the park. Wading through a river was refreshing, wading through grass and weeds was not. Overall though, the 4 Mile Loop trail did what it promised to do. It sheltered us from the crowds for a few hours and for that we are grateful. This was a really lovely hike. I didn't really enjoy fording the Pedernales River but after that I really liked the scenery. I took the spur to make the hike longer. It was amazingly beautiful terrain but I did come across fresh feral hog signs. Since I was in total solitued that was a little bit disconcerting. It appears that the pack of hogs moved across the park, N/S direction because I came across additional signs on the nearly directly opposite side of the trail. One additional thing - the solitude was very nice but became disquieting on the spur. Be aware that there isn't a whole lot of traffic on the spur trail and plan accordingly. From reading previous logs, this used to be called the 4 Mile Loop Trail, but it's now called the 5.5 Mile Loop Trail. I'm not sure if more distance has been added or if previous measurements were wrong, but my GPS showed 6.17 miles by the time I finished so I believe 5.5 miles is an accurate description since I did a little extra. 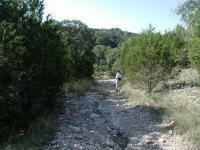 The first highlight of the hike was crossing the Pedernales River at Trammel's Crossing. The water was very shallow (several inches deep), but the current was strong enough to make the mossy rock underneath the surface a little slippery. The water was also very cold and made my feet numb, but in a good way. By the time I got back to Trammel's Crossing, my feet were a little sore so I was looking forward to the chilly water. All in all, this is a good day hike that provides a few miles in the Hill Country. I took a quick Sunday afternoon trip to PFSP and made the 4 mile loop. I almost backed out of doing the 4 mile loop because the river was so high. It got pretty tricky wading acrolls Trammel crossing with the current. The trail is pretty much typical for a hill country SP trail (old ranch road) but was still quite enjoyable. It had its moments when the scenery was very good. I especally enjoyed spending some time looking at an old rock wall and cemetery located in the NE corner of the trail. I did some research trying to find more information about the old cemetary but I found nothing other than a few comments from other hikers. Beware if you hike this trail in the summer heat make sure and bring plenty of water. The biggest part of the trail in in direct sunlight. The trip back through the ford was nice. I spent some time letting my feet soak after the hike. All in all a nice little hike. Went with my sister. The trail and park were empty it being a Wednesday. The solitude was fun. Clouds were out so it was more fun. Was pretty easy, trail was simple. Did not see any views. We took a shortcut, maybe the views were with the trail we missed. Overall a lot of fun, especially sitting in the river at the end. We started off from the beach access point and walked along the river to the trammel crossing, instead of at the normal trailhead. The beach is really beautiful and had some great places to just hang out. The hike was easy once you get past the first hill, but a couple of people in the group I was in slipped on the ashpalt/gravel path in the steep parts. There are some great views of the hill country, and some very pretty fields of wildflowers and cactus, but large parts of the trail are surrounded by cedar breaks and are just a little boring. Overall, a nice, relaxing hike. It was very sunny and there's very little shade on this very wide path, so we were all hot and tired by the end of it. Looping back to the river and just cooling off and sitting in the sun was a nice way to end the day. nice trail, but very poorly marked - we got lost! I do a lot of hiking and don't usually get lost, but about a mile into the loop, the trail just faded away and we ended up bushwhacking through the woods for 20 minutes trying to find it again. We crossed the river, which was about ankle deep after a few days of rain the week before, climbed a steep hill, and then the trail evened out. It was pretty much flat all the rest of the way until we lost it in the woods. Since we had my husband's parents with us, we turned around and went back to the river for a swim, which was lovely! We didn't see anyone else on the trail at all once we crossed the river. Nice hike, but I missed the settler's grave site in the back. Oh well, I'll have to go back. As we were finishing the trail, we saw two other people. It was a nice hike, but there was little shade. We went on a hot day in the middle of the day, but it was worth it. Swimming at the beginning at end was great. I can see why so few people make it to this trail. The lady at the front gate was incredibly discouraging when I just asked how to find the parking area for the trailhead. "Unmarked", "Can get stuck on the other side of the river if rain hits", "People get lost back there", and other choice bits of encouragement. I have no idea what she was talking about really - the trail was very well marked on the portions I went on. It got a bit boring after crossing the river, so I took the crossover trail between the two sides of the loop trail to cut it a bit short. The area around the "trammel crossing" is gorgeous.